Industry Receives the Support of the Governor of Istanbul: "Removing the Industrialist from Istanbul is Not Realistic"
The March ordinary meeting of the Istanbul Chamber of Commerce (ICI) Board was based on the main theme of "Starting from the Premise that Istanbul cannot Exist Without Industry, Working Together to Create an Istanbul with a Higher Quality of Life, More Productivity and Stronger Competitive Power." 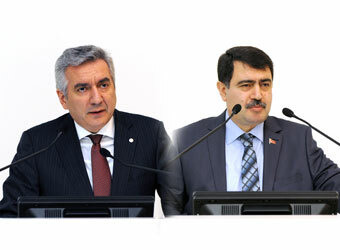 Speaking at the meeting, at which the Governor of Istanbul Vasip Şahin was a guest, ICI Board President Erdal Bahçıvan asked for the support of stakeholders and the public in bringing to life the "Istanbul Industrial Strategy Document" that had been prepared to help Istanbul industry reach its high potential in terms of global competition. Istanbul Governor Vasip Şahin's words to the effect that "Removing the industrialist from Istanbul is not realistic" were the highlights of the ICI Assembly meeting. Particularly stressing his belief that, as in the past, industry plays an important role in the healthy development of a city, ICI President Bahçıvan said, "This is why industry is so important. It can be said indeed that communities with high standards of living that exist in peace and prosperity are communities that have succeeded in their industrialization." Istanbul Governor Vasip Şahin, taking the floor at the ICI meeting led by Assembly President Zeynep Bodur Okyay, expressed his view that completely removing industry from Istanbul was not realistic. 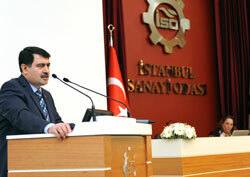 Stating that with time, Istanbul industry would reach a more technology-based structure with more added value and that incentives would probably cause heavy industry to eventually be relocated in the rural areas, Istanbul Governor Vasip Şahin said that nothing should be done by force, stressing that he was looking at the situation from the perspective of the industrialist. Pointing out that the job description of the Governor was to contribute to the development of the city's economy but that in a city like Istanbul, there were many leading industrialists and business persons who were doing just this, Şahin said, "All we need is for you to produce, create jobs, increase exports and we will support you and serve you in every way." Also referring to the Istanbul Industrial Strategy Documents that ICI had disclosed a while back, Governor Vasip Şahin said that the public needed to be more active in this matter and that the obstacles standing in the way of industry should be removed. Making the opening remarks at the ICI meeting, ISO Assembly President Zeynep Bodur Okyay commented that the first quarter of 2015 had not passed as industrialists had expected, continuing, "We are very enthusiastic about launching a new industrial offensive. We have set sail for achieving growth in industry. People do not take warmly to the idea of having industry in Istanbul but an Istanbul without industry would be unthinkable. We need to pursue the matter with an integrated approach, using all the instruments industry has to offer." Okyay explained that ICI had created the Industry-Technopark Working Committee because local administrations were of the great importance in achieving industrial growth in Istanbul. Speaking at the Assembly meeting, ICI Board President Erdal Bahçıvan reminded the audience that the role industry plays in the development of a city and making it a center of attraction must not be forgotten. Bahçıvan noted, "In today's fiercely increasing competitive atmosphere, competitive power in the cities is gaining more and more importance." In view of this," he said, "with the support of the Istanbul Development Agency, we have defined 46 strategies under 18 headings and 85 action plans to enhance Istanbul industry's global competitive power and reach Turkey's export goals for 2023. We have a road map in the Istanbul Industrial Strategy Document that tells us what must be done. It must be appreciated that the Istanbul Chamber of Industry cannot do this on its own. This is why the document very clearly explains the process to stakeholders. This project needs the support of our stakeholders and also the general public. Explaining in his talk that 27 out of every 100 units of value added in Turkey's industrial sector is generated in Istanbul, Bahçıvan said that Istanbul was Turkey's most prominent import and export base, stating, "Istanbul's share in the general budget tax revenues is around 46.1 percent. Our city is at the vanguard of Research and Development and innovation. As of 2014, 43.3 percent of the 5000 patent applications made to the Turkish Patent Institute originated from Istanbul." 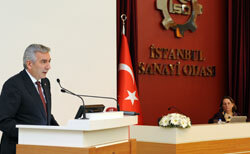 Bahçıvan said that as stated in the Strategy Document, the only infrastructure in Turkey that has the capacity to increase high-technology-based exports in the shortest time is in Istanbul, adding, "While Istanbul is responsible for 67.2 percent of Turkey's exports of high-tech products, it also holds more than a 50 percent share in exports of goods in the medium-high technology category. For this reason, without improving the working environment of Istanbul's industrial export players in the market, without increasing their capacities and building the needed infrastructure, and without ensuring that the main inputs of energy, raw materials and especially qualified human resources are procured, Turkey cannot be expected to reach its 500 billion dollar exports goal for 2023." New Organized Industrial Zones (OIZ) for Istanbul: There is a need for new OIZ's in Istanbul; we have received a great deal of requests for this. The smaller industrial complexes should join together and relocate, moving into the larger industrial complexes instead of into the OIZ's. 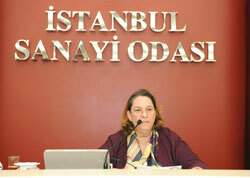 Attractiveness of investing: Istanbul is not attracting industrialists and therefore investments are inadequate. Incentives should be provided for this and changes made in the legislature. New fair grounds: Istanbul needs new fair grounds. Fair capacity is no longer adequate in Istanbul and so we are working on this. Migrations to Istanbul: If we think that industry is drawing in migrants, we have to remember that there is a rise of 210,000 in Istanbul's population this year whereas only 40,000 out of this figure constitutes migrants. In times past, it was true that industry increased Istanbul's population but today, Istanbul's population is rising due to other factors. The traffic issue: The request to have concrete-carrying vehicles and trucks enter Istanbul is justified but we also have to think of the tremendous concentration of traffic in Istanbul. We need to implement strategies that other metropolises have tried and succeeded with in solving their traffic problems. I also believe that 30 percent of the traffic issue stems from the ordinary citizen's lack of tolerance and respect for other people.